Pandora-Gilboa’s Jared Breece put up impressive numbers last season and looks to have a repeat performance and carry the Rockets to the playoffs. 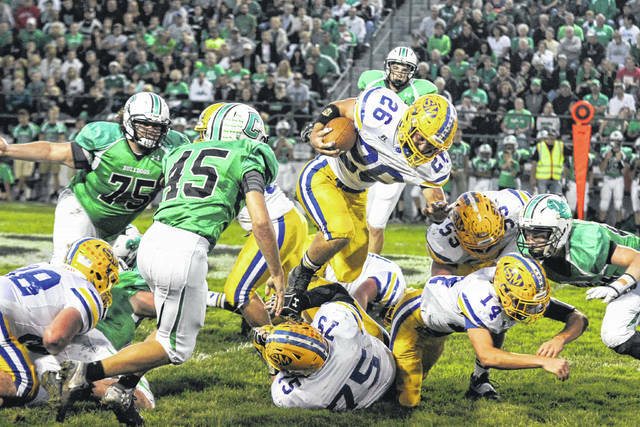 St. Mary’s Ty Schlosser was part of the Roughrider backfield that helped capture the Western Buckeye League title. He, along with the rest of his teammates, will try for a third straaight title this season. Who are the frontrunners to make state? The usual suspects in the Midwest Athletic Conference are the first on the list with powerhouses Marion Local, Minster, Coldwater and whatever other MAC team wants to step up this year and make a run to state. Other contenders in the area are Spencerville, St. Marys, Crestview and others to name just a few. Like last year, several teams such as Pandora-Gilboa and Delphos St. John’s made big runs in postseason so expect a team to emerge from the pack to make a run to Columbus. WBL teams like St. Marys, Wapakoneta and Celina look good for a strong postseason run and in the Northwest Conference Crestview Crestview, with Wade Sheets and Drew Kline back for another year the Knights have a solid shot in the playoffs. Let’s not forget Lima Central Catholic that nearly pulled off the upset of the year against Coldwater last season. Can Jerry Cooper turn Shawnee around? Where ever Cooper has gone he has won games and he hopes to do the same for Shawnee that has been down the last several years. Led by quarterback Johnny Caprella, Shawnee turned head’s in the early part of the season withsuccess, however, injuries on the offensive and defensive lines caught up to the Indians who struggled in the second half of the season. If Cooper can harness some of that energy from the some of the talent on Shawnee, some WBL teams may be surprised. Can Perry continue its winning ways? Luke Taviano took Perry to new historic heights last season by taking the Commodores to a winning record for the first time in nearly two decades and an an appearance in the playoffs. But Taviano has moved to Delphos Jefferson and it is up to first-year coach Daniel Baker to guide the Commodores. Several of the parts remain from last year’s so but he faces a big challenge to repeat last year’s success. Speaking of young coaches what other first time coach has big challenges ahead? Allen East, Ada and Bath all got new faces to take over the coaching chores and all three are first time coaches, Ada’s Shaun Christopher will look to keep Ada’s playoff streak going while both Allen East’s Wesley Schroeder and Bath’s Bryant Miller are looking to reverse the fortune of their respective football programs. The NWC was one of the best conferences in the area. Can we expect the same? The top three teams made the postseason with perennial playoff team Delphos Jefferson coming up short. Spencerville captured the league title outright for the first time in school history, under first-year head coach Chris Sommers. But Crestview, who had a 7-1 mark, returns quarterback Drew Kline and Wes Sheets, and will be a force to reckon with throughout the year. Ada has a new coach (see above) as does Jefferson (Taviano) so expect the race to be close again. Looking to break into the top three are Bluffton, Columbus Grove, Paulding and Allen East. Can St. Marys repeat as WBL champion? The Roughriders went undefeated and won the WBL by two games last year. However, St. Marys loses some senior talent that should make the league race a little more interesting. Elida, who made the playoffs, has some key members back from a team that went 8-3 overall and Celina which also bounced back last year under new head coach Brennan Bader should be better. Add Kenton, Van Wert, Shawnee and a healthy Ottawa-Glandorf to the mix and it might be a little more difficult for the Roughriders to go unbeaten in the league again? What team will step up in the NWCC? Lehman Catholic beat Perry to take the league title and then beat Perry in the postseason. Expect Lehman to be the frontrunner with the Commodores close behind along with Elgin. Waynesfield- Goshen took a major step towards getting better after winning its first game in two years but they have room to improve. Upper Scioto Valley took a step back last year and the numbers hurt their chances with little depth to fall back on. Can Lima Senior return to its winning ways? For the first time in five years, Lima Senior suffered through a losing season after some heartbreaking losses. The Spartans return a core of talent including receiver Jaleel King and lineman Brandon Taylor. However, head coach Andre Griffin will have to find a new receiver, re-establish the running and game and solidify the defense if the Spartans want to return above .500. A new offensive coordinator could jump start the offense and a solid defensive backfield could pave the way for a winning season. Can LCC make another deep playoff run? LCC bounced back with a tremendous year by going 9-1 in the regular season. The Thunderbirds were within one quarter of beating Coldwater before the Cavaliers made an amazing comeback to clip the Thunderbirds and end their season. The return of phenom Shaun Thomas will give the Thunderbirds a big weapon on offense but LCC still has a number of holes they need to fill if they are have another big season. Like LCC, can Pandora-Gilboa repeat last year’s success? The Rockets surpassed most people’s expectations last year by making it to the regional finals before bowing out of the playoffs. 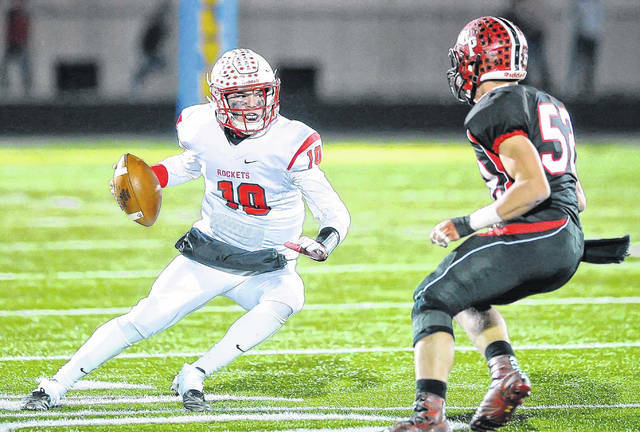 Pandora-Gilboa lost a several pieces to graduation, however, the Rockets return quarterback Jared Breece who should provide stability on the offense and there top running back. With a bulk of the defense coming back, the Rockets look ready to return to the playoffs and hopefully garner that elusive Blanchard Valley Conference league title. https://www.limaohio.com/wp-content/uploads/sites/54/2018/08/web1_PG-vs-St-Paul-RP-008.jpgPandora-Gilboa’s Jared Breece put up impressive numbers last season and looks to have a repeat performance and carry the Rockets to the playoffs. https://www.limaohio.com/wp-content/uploads/sites/54/2018/08/web1_St.-Mary-s-vs-Celina-Football-3654.jpgSt. Mary’s Ty Schlosser was part of the Roughrider backfield that helped capture the Western Buckeye League title. He, along with the rest of his teammates, will try for a third straaight title this season. This entry was tagged Ada, alleneast, bath, Bluffton, celina, coldwater, crestview, delphosjefferson, delphosstjohns, Elida, High school football preview 2018, limacentralcatholic, limasenior, marionlocal, Minster, pandoragilboa, paulding, perry, shawnee, Spencerville, stmarys, Wapakoneta, waynesfieldgoshen. Bookmark the permalink.